thickening agents in soups. A beer can be brewed from the young shoots. A CHEMICAL THAT CAUSES CANCER IN TEST ANIMALS. Growth Form: Tree or shrub. Leaves: 7.5-13cm (3-5in) long, 4-10cm (1.5-4in) wide. Ovate and not toothed with no, 2 or 3 lobes. Reddish petioles. Flowers: Tiny, 10mm (.4in), yellow-greenish, appearing in early spring. Fruits: Oval blue-black berries in red cup, one-seeded. 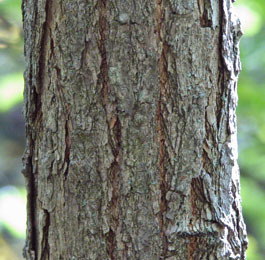 Bark: Brown and reddish or grayish, becoming furrowed. Forests and thickets on mesic to xeric soils in uplands and valleys. Southwestern Michigan to Maine, south to central Florida and west to eastern Texas. Roots can be harvested throughout the year. Leaves should be gathered in spring and early summer. 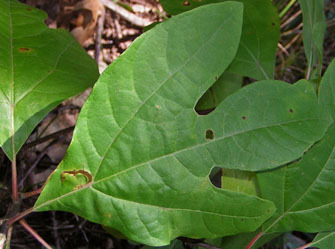 Sassafras oil from the root bark is used to perfume soaps and flavor root beer. Early colonists thought the root bark to be a cure-all, and shipped large quantities back to Europe. 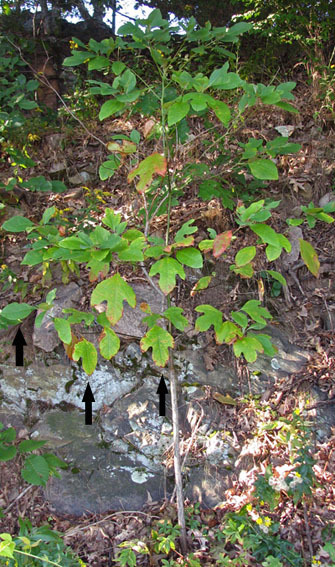 Whole tree, with arrows pointing to 3 leaf forms (left to right): no lobes, 2 lobes, 3 lobes.